This talented outfit was put together in Birmingham by Davis although the group was dominated musically by the amazing and very young Steve Winwood. The group preferred to play blues, but their first single in this genre didn't do well and is now quite collectable. Their next three bluesy singles did reach the lower part of the chart but it was the much more commercial 'Keep On Running' that allowed them to hit the big time. The EP illustrated here is the first of their two hits on that format. It sold quite well and isn't really that difficult to find. Nevertheless, the popularity of the group makes it quite a sought after item and it commands quite a high price. This began a string of successful singles that went on until 1968, by which time Steve Winwood had left to form 'Traffic'. Although Davis soldiered on, and continued to turn out good music the hits soon dried up. Davis went to live in the USA, but continued performing musically. Muff went into A&R and his remarkable younger brother has maintained a low key but lucrative musical career ever since. 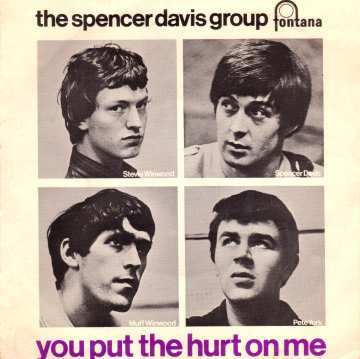 Fontana TE17450 1966 "Every Little Bit Hurts"